Carl Frampton insists that he has to win in style on his ‘second coming’ against Mexican Horacio Garcia at the SSE Odyssey Arena tonight in Belfast. ‘The Jackal’ tops one of Irish boxing’s biggest ever fight bills this weekend as the ‘Frampton Reborn’ card also features Jamie Conlan challenging for the IBF world super-flyweight title while three-time Olympian Paddy Barnes competes in his fifth pro bout, live on BT Sport and BoxNation. For Frampton, it is a significant fight date for a number of reasons with the two-weight world champion making his ring comeback after suffering his first defeat against rival Leo Santa Cruz last January. The bout also marks the 31-year-old’s first outing since building a new team, with promoter Frank Warren and advisors MTK Global now aiming to steer Frampton towards another world-title shot next year. “I need to win impressively to tee up a big 2018,” said Frampton. “I’ve made a few changes with my team and this is the start of a new beginning for me. This has unfortunately been the worst year of my pro career after the loss and then everything that’s happened since then. “I have a new promoter in Frank and the BT TV deal is huge, so I want to make a good impression in my first fight with them. I’ve also linked up with MTK as well and we have big plans for next year, so I have to get the win this weekend and I hope to win in style,” added the Jackal. Frampton split with long-time mentor Barry McGuigan a few weeks after his planned ring return against Andres Gutierrez last July was cancelled. Mexican Gutierrez was ruled out of that clash after suffering an accident less than 24 hours before the bout was due to take place. While ‘The Jackal’ was regularly compared to his fellow former world featherweight champion McGuigan since turning pro in 2009, Frampton insists that he does not feel like he is stepping out of his old mentor’s shadow. “I don’t think that’s an issue really,” said the Belfast native. “Obviously we were always being compared. We had a lot of similarities – a protestant marrying a catholic and all that stuff and people liked to make a big deal about that – but in terms of fighting style, we weren’t really similar fighters. Frampton and Garcia took to the scales yesterday afternoon ahead of their 10-round featherweight bout. Both fighters came in at 127lbs, benefitting from a previously-agreed two-pound excess allowance ahead of the non-title fight. Garcia is a big underdog with the bookies, but while the 27-year-old has suffered three defeats in his 37-fight career, the Guadalajara native (33-3-1) has never been stopped. The Mexican will have his compatriot superstar Saul ‘Canelo’ Alvarez at ringside to cheer him on and Frampton expects his opponent to present a tough test on his ring return. 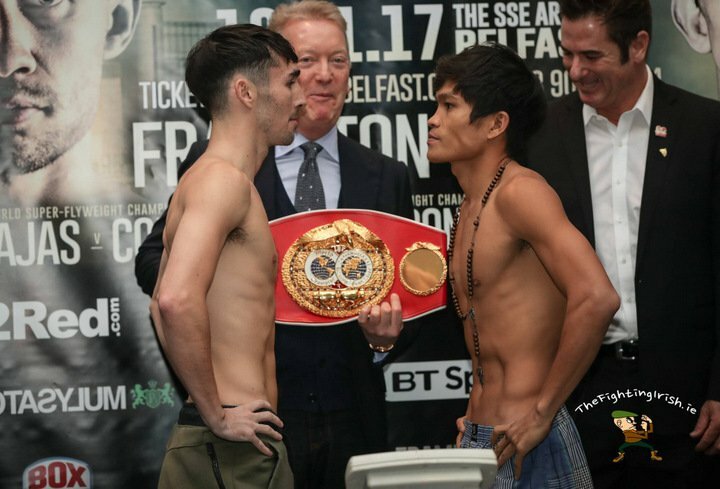 On a huge night for Irish boxing, Jamie Conlan will challenge Filipino champion Jerwin Ancajas for the IBF world super-flyweight title in the chief-support bout. The Conlan clan will boast two world champions should the Belfast challenger emerge victorious in front of his home crowd as his younger brother Michael claimed a world amateur title in Doha back in 2015 before turning professional earlier this year. Conlan (an undefeated 19-0 as a pro) clocked in at 115lbs at yesterday’s weigh-in – the same weight as the Manny Pacquiao-promoted Ancajas (27-1-1). The challenger believes the 25-year-old champion is a skilled and dangerous southpaw, but insists he is ready for his big night. Two-time Olympic medallist Paddy Barnes is the third member of Belfast’s famous fighting ‘Three Amigos’ featuring in big bouts tonight with the European amateur champion and WBO European flyweight champion aiming to claim his second pro belt. The 30-year-old (4-0 as a pro) takes on experienced Nicaraguan Eliecer Quezada (21-6-3) after some drama on the scales yesterday. Barnes was forced to strip off in front of his Belfast fans in order to make the 112lb flyweight limit, with trainer Danny Vaughan shadowing the fighter with a towel as he successfully weighed in. However, Quezada was unable to make the weight after two attempts, meaning the vacant WBO inter-continental title will only be on the line for Barnes when they clash tonight. “It doesn’t make a difference to me,” said Barnes. “I still have a job to do. I had to whip off my boxers to make the weight, but I was happy to give the fans something to get excited about! A total of 11 MTK Global-managed fighters feature on the ‘Frampton Reborn’ fight card, which will get underway at 4.30pm (approx) with TV coverage starting at on BoxNation from 7.25pm and on BT Sport 1 from 8.30pm. Hard-hitting welterweight prospect Lewis Crocker claims he has embraced his heavy-handed reputation as he aims for a fourth knockout on the bounce on Saturday night in Belfast. The 20-year-old turned pro last March, having gained a fearsome punching reputation as an amateur and he has duly delivered on that promise by recording three early wins over the past eight months. The Belfast native will fight in his hometown on the undercard of this weekend’s ‘Frampton Reborn’ fight bill when two-weight world champion Carl Frampton takes on Mexican Horacio Garcia live on BT Sport and BoxNation. While fights fans and the media have gradually built up Crocker’s wrecking-ball reputation, the welterweight insists he does not feel any pressure to blast his opponents away despite all the talk surrounding his power. “There was more pressure going into my first fight than what I feel now. I’m just getting confident. I’m dropping people and getting better each fight as well, so that’s just building my confidence. I’d love to get another knockout on Saturday. I can’t wait. I’m looking forward to fighting in the SSE Arena,” said Crocker, who features in a four-rounder against Hungarian novice Gyula Rozsas on Saturday night. Hailed as one of the standout prospects in Irish boxing, the MTK Global-managed talent is happy to be marked out as one to watch. Crocker is trained by up-and-coming coach Ray Ginely, himself a former 6-0 pro prospect who is just three-and-half years older than his protégé. “It’s brilliant working with him,” said the 20-year-old. “Me and Ray get on great, so we do. We’ve a great relationship and it’s worked so far, so I think we’re going to go on to even bigger things in the future,” continued Crocker, who believes a recent trend of fighters teaming up with their contemporaries in the gym will continue. “I think it’s far better – there’s a lot of science behind sports in general now and some of the older coaches maybe don’t agree with that, but Ray understands that,” said the Belfast welter. “He understands the need for rest days and stuff like that. Tommy McCarthy is delighted to be back in regular action, but the Belfast cruiserweight is aiming for another early night on Saturday at the SSE Odyssey Arena. Former Irish Elite amateur champion McCarthy (10-1 as a pro) takes on Manchester-based Cameroonian Blaise Mendouo (4-7) over six rounds on the undercard of the ‘Frampton Reborn’ fight bill in his hometown of Belfast this weekend. After a nearly a year out of the ring, Saturday’s bout marks McCarthy’s second fight in the space of four weeks following his one-round demolition job on Hungarian Peter Hegyes last month. While Mendouo has suffered seven career defeats, the visitor has only been stopped once – by hard-hitting Englishman Daniel Dubois – but McCarthy is confident that he can deliver another all-action display. “Hopefully it’ll be more of the same,” said the 27-year-old. “I think y opponent is a bit more durable, so hopefully there’s a bit more about him. It might take a bit more than one round, but if I can get him out of there in one round, I’ll do it. Prior to his ring return last month, McCarthy had not fought since November of last year when he suffered his only pro defeat – a points loss to England’s Matty Askin, who subsequently went on to claim the British title. And the former Irish amateur heavyweight champion is delighted that his brief ‘semi-retirement’ period is now at an end. 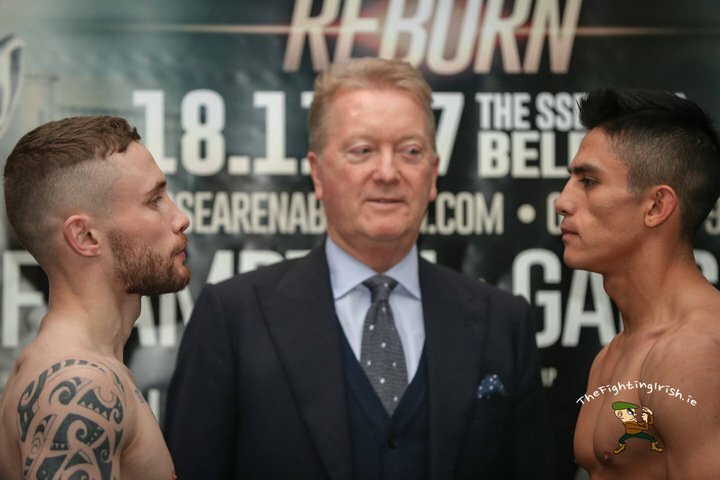 Carl ‘The Jackal’ Frampton tops Saturday’s bill, making his ring return against Mexican Horacio Garcia in a 10-round featherweight bout, live on BT Sport and BoxNation, while Jamie Conlan challenges for the IBF super-flyweight title against Filipino champion Jerwin Ancajas. 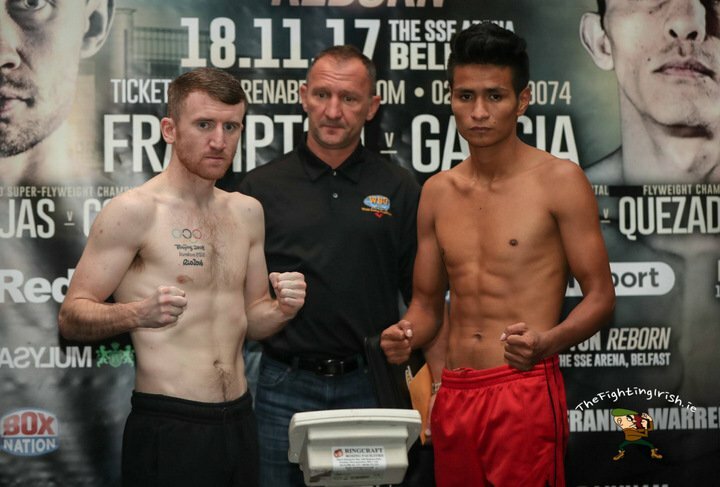 Paddy Barnes also features on the bill, taking on Nicaraguan Eliecer Quezada for the vacant WBO intercontinental flyweight title.